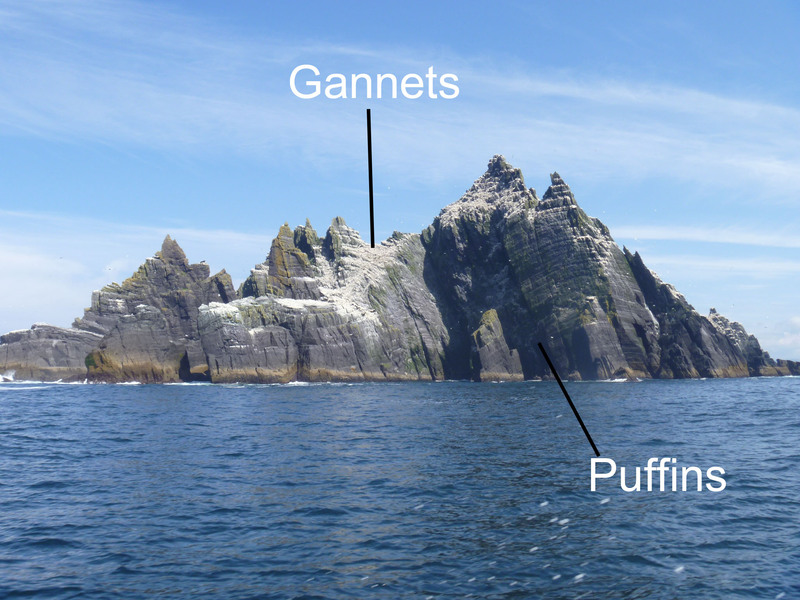 Had my sister Paula not read in her guide book about an offshore rock group with an ancient monastery at the top, we might never have visited the Skellig Islands. We considered hiking to the top of the 600+ steps to see the domed stone cells that may date back to 600 AD. If that weren’t enticing enough, the site appears at the end of Star Wars: The Force Awakens and in the trailer for the next Star Wars movie. It’s an intimidating place. 12 km off shore, a jagged triangle juts from the water. After reading about landing, where there is no dock and heaving seas may toss you in or out of the boat, we decided against it (Tours are sold out for the entire season, too). We decided to take a ride around both islands to see the steep steps and birdwatch. It was a wonderful tour! We had total weather karma. The day dawned sunny for the first time since we arrived in Ireland and stayed sunny and warm ALL DAY. It took us just over two hours to drive from our house in Dingle to Port Magee, mostly along the Ring of Kerry drive, so you could say we were multi-tasking in the tourism department. Our boat left at 11:45 am and we were asked to arrive at the dock by 11:30 am. A friendly young man named Brendan, dressed in a dirty tshirt and jeans strolled out and ticked our names off a list on his phone. He led us to the boat where there were 12 outward facing seats hung with life jackets. 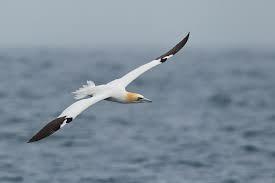 Dressed, we took off, heading straight out to sea for 45 min. The islands, two triangular chunks of rock, stick up out of the sea and are easily visible from shore. Cliffs and hills line the coast on the way out to sea from Port Magee, then Puffin Island off to the south, then sea birds zoom alongside the boat or bob on the water. (What are they doing, just hanging out in the middle of the ocean?) 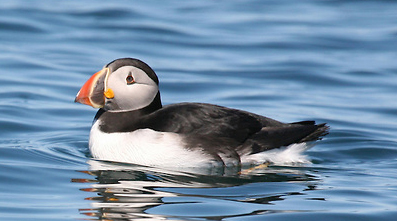 We saw gannets and then puffins, the world’s cutest birds. More steps wind up the face of the rock. Made of slabs of the island rock, it’s a long hike. The path on the right is not used today, though rock climbers can access the top this way. The safety video that is recommended for people considering a landing on Skellig Michael shows what the climb looks like in wet weather. (As I write this, the fog is so thick that we can see nothing beyond the front yard of our house. I wonder whether the Skellig boats will go out today.) The safety video shows the stone steps. One reason to make the climb to the top is the archaeological site, a tiny monastery of stone beehive huts enclosed by a wall that was in use at various times from the 8th century until the 13th century. Monks rowed out to the island, climbed to the tiny settlement and lived their hermit existence. The island was finally abandoned when the climate began to shift toward colder weather after 1300. 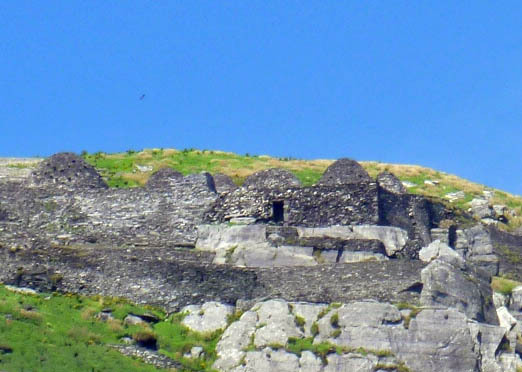 There are beautiful views of the archaeological site on the Heritage Ireland website. From Skellig Michael we went on to Little Skellig, a bird sanctuary. The entire surface of the island is alive with birds. This is home to one of the largest gannet colonies anywhere.Up close, you see the white area is all birds, calling, flying, wriggling and doing what birds do. 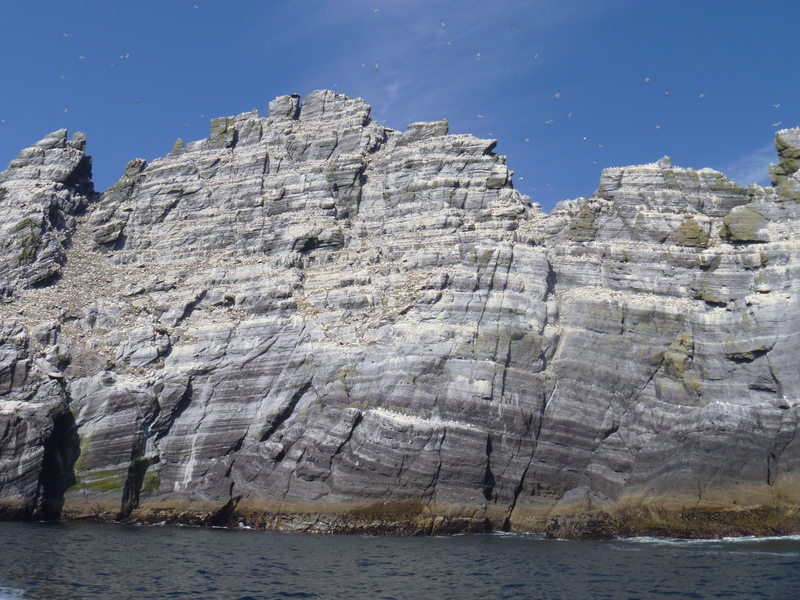 The majority of the birds are gannets, but in the lowest most sheltered crevices we could see puffins. So many birds, so little time. 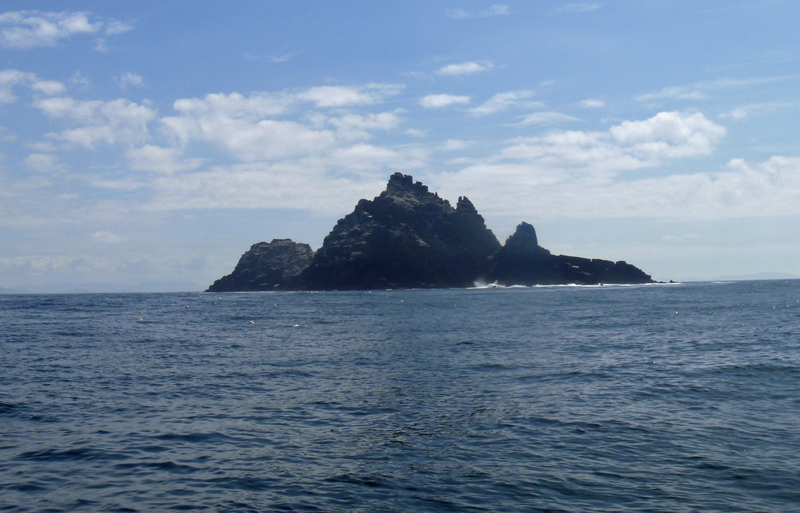 From Little Skellig, we sailed back to Port Magee, delighted by our brilliant day.